Do Trion Z Bracelets Really Work? The Trion Z bracelets are supposed to be able to give you balance by combining negative ions with magnets. Those that believe in these sort of gadgets swear by them, but there are a large number of people that say it’s all a bunch of baloney. Both sides can’t be right, so we decided to look into the matter and render our verdict on how well it works, if at all. Negative ion bracelets have been popular for about a decade now, and each one makes various claims as to what sort of technology they use to make it work. In the case of Trion Z they are stating that they combine negative ions with magnets, and this is what makes it special. No doubt you will see a product come along in the near future that says it uses a third method. It’s like an arms race between these competing bracelets, and each one tries to differentiate itself from the others, and give plausible reasons why it works. Trion Z says that the magnets on their wristbands help to improve the blood flow and increase your body’s natural healing power. They also say that the negative ions it contains helps to counteract all of the positive ions that are produced by the body that cause stress and other health problems. They also claim that they do not pay athletes to wear their bracelets, and that they wear them because it works. This is not a logical conclusion, or a correct statement. they do not know the motives of the athletes, and are only guessing as to why they are wearing the bracelets without being paid. A more proper statement would be that these athletes think it works. The hype comes from all of the talk about negative ions and magnetic fields. By talking about things that are invisible to the naked eye, you can make any sort of claim you want to, without worrying about having to prove it. What clinical trial could be applied to it that would be able to convince people that it actually produces negative ions, or has any effect on your magnetic field? Also, they go with the story that our modern lifestyle is causing all sorts of chaos to the body. This is a technique often used by supporters of alternative medicine as a way of making the case of needing things like detox, and flushing the body of toxins. Whether our world is any more or less harmful than it was hundreds of years ago is not something that any one company can declare. If our modern world is so much worse off, why do we live three times as long as we used to? The Trion Z varies in price by which model and size you get, but should be around $15 for most models and sizes. All that’s required on your part is to wear the bracelet. That’s the lure to these sort of things, that you’ll get some amazing benefits just by putting it on. Products that have almost zero commitment on your part, but promise a radical transformation in the way you feel, should set off a series of red flags. With something like Trion Z you’re always going to find some positive reviews. If people have bought into it, and believe it will work, they probably will experience some sort of results to it. However, this is the same things as a sports player have a pre-game ritual, or believing in a superstition like wearing lucky underwear, or tying their shoes a certain way. All of the benefits purported by this bracelet can be had without getting it. You can experience the same sort of good feelings, increase in balance, and less stress just by getting more active, and doing some form of regular exercise. Don’t pass the responsibility of staying healthy to a bracelet. You can take up something like yoga, or Tai Chi, or start meditating. Read self improvement books that teach you how to have more positive thoughts. All of these will produce the good feelings you’re looking for, and will permeate into all areas of your life. 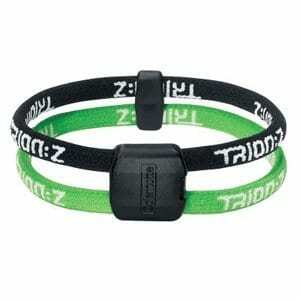 The Trion Z attempts to take negative ion bracelets to a whole new level by adding magnets to them. However, two wrongs don’t make a right, and there’s just no reason to think that wearing this has any effect on your body, your health, your mood, or your athletic performance. Just because athletes wear them doesn’t mean they work, it just means that they think they work, and most sports are just a mental game, and players will do anything to get that mental edge. We’re pretty convinced that these sort of products rely entirely on the placebo effect. This doesn’t necessarily mean that you shouldn’t buy it. If you think it will work, and you expect it to work, you might actually get some benefit from wearing it. You might get some peace of mind from having it on, and in the end feeling good is all that matters. However, you should not rely on any bracelet to give your health or life a complete turnaround. Take steps to gradually improve your life through proper diet and exercise, and if you feel like including a Trion Z into the mix, by all means, go for it. What do you think? Does Trion Z work or not? Does Montel's Encyclopedia Of Home Remedies Really Work? Does Migrastil Migraine Headache Stick Roll-on Really Work? I don’t know that products like these are completely reliant on placebo effect. I often have blood circulation problems so one day my friend lent me her magnetic necklace and bracelet and I could swear that it worked wonders for me. The only problem is that the brand she bought went out of business, most likely because people don’t have faith in products like this. I don’t have any scientific proof, so I can’t say for sure it will work for everyone, but for me it did and that’s why I’m going to try trion z.
I think your review is quite a negative and uninformed one. Ive been a sceptic for years but i found trionz very effective .Triion z is the only product accredited by british health authority (has to be tested to get that) . and your comments about no reason to believe charged magnets could affect us is a bit silly. We have a magnetic field as living beings that is proven fact. And the magnetic and frequency pollution we are surrounded by because of the technolgies we use now is also a proven fact. There are countless recorded cases of people and animals being badly affected by this. So why couldnt magnets charged in a certain way help balance our magnetic field in a way that improves our wellbeing. I agree. How can a company or individual like this that writes such a negative, vague and pathetic review be taken seriously. It is like looking at a review written by someone’s Grandad! I noticed quite a few effects in the short term: relaxation in joints and improved blood flow. The bracelet is easy to wear and you forget you have it on most of the time – the only moment it bothers me is when I wash my back in the shower. This is quite an achievement for somebody who doesn’t wear any jewelry. Over the long term, I’ve noticed that the wrist I wear it on (the left) has become much more relaxed, which is helpful for playing the bass notes on the piano. I once broke a bone in that wrist, which might explain why it was a bit stiff. If you think it might help, give it a try. I’ve never understood why people scoff at the so-called ‘placebo effect.’ The mind is a really powerful healer and we underestimate it at our peril. Using your mind to heal yourself is much healthier than stuffing yourself with industrial drugs anyway. This is not a very good article on facts. You bash on this company’s products as if you know all about the things they are supposed to do. 2) Negative ions is a true theory also. Do some research on this and look throughout the web on this subject too. Negative ions help reduce stress which in turn helps focus which is why they are marketing it to athletes as well as just someone who needs pain relief. You are also negating true facts, i talked to a trion:z person and they confirmed that they do not pay the athletes that wear them. They wear them because they like them and play well with them on. Maybe they do have superstitions that help their game, but what if they wear it because when they started wearing it certain pains they had went away? or their focus became better while wearing it? You being a non-professional athlete shouldn’t be stating your assumptions when you are not a professional athlete who understands what it’s like to be at the top level of a sport. For you to say this is the placebo effect shows you are just throwing out your opinion. My friend who turned me on to these bracelets has arthritis , when he wears it the arthritis pain is greatly reduced , when he takes it off the pain slowly comes back. There is no way that is the placebo affect!! I have 5 friends who say this product really helps with those types of pains. Also, how can you still say this is the placibo effect, when you have 37 of your 43 answers of “does it work” saying “yes? This product works, it’s the “balance bracelets” that claim a hologram can give you perfect balance that is a bunch of BS. Please try the product and do better research before doing any product reviews because the reviews on this product are way, way off! I bought it with the intent to use something for my knees and my stress level without using drugs and I honestly have found that it is working for me. I work retail and I’m on my feet all the time, when I squat down to grab something my knees would always hurt and now they don’t. Say what you will, everyone has a right to their own opinion but I will keep wearing mine and I feel better since I have been using it. Let’s not even start wondering about whether Trion-Z as a brand works. It has been proven countless times that Negative Ions do have a positive effect on people. Naturally occurring negative ions being the much better source, but if the Japanese are to be believed, any form on Negative Ion is better than none at all. Hence, if a device can be proven to emit negative ions (you can buy counters to measure them, or look up YouTube videos where people have done so), it would be beneficial to a person. Whether it benefits immensely or not is a different question altogether. …So for you naysayers, REMEMBER THAT NOT EVERYTHING WORKS FOR EVERYBODY….placebo effect? who knows…but if it is, it’s a hell of a powerful one, to be able to help me with balance, energy, and ‘ache-y legs!!!!! This is the stupidest article i have ever read. 2)The magnets help with blood flow and pain , ever heard of magnetic therapy? and the negative IONS are to help with stress and focus – you can read about negative ions on a bunch of websites on the internet. 3) This helps focus and stress and stuff with sports like golf and bowling , ever since i got one i have hit a couple of 300 games – this helped me in the crucial frames of 9 & 10 when i used to get too nervous. 4) An older friend has arthritis and he said these work great for his pain!!! 5) Reading the writing style of this author makes them sound like a restaurant waiter telling you how to pick the best vitamin for you… he has no clue and is making things up as he goes along , geez i thought this article would have some kind of proof – but what an idiot to post an article like this, this should be taken down for lack of proof!!! This product is fantastic in my opinion and after reading other comments further proves this article needs to be taken down!!!!!!!!!!!! At first, I feel this product is doubtful. Looking for the answers on the internet and finally I decided to buy this product. Why I bought this product is because I had a backache and shoulder pain for more than a month. At first, I wear this product and nothing happen. After a few days I wear this product, I don’t feel any pain. I have used it for more than 1 month now.